"If you break through the Earth's crust now you'll release forces you never dreamed existed!" 20th Century Earth. An unhinged scientist, Professor Stahlman, is attempting the first penetration of the Earth's crust in a top secret drilling project called Inferno. His purpose? To tap into a new energy source at the core. But at what cost? When the Doctor is called to Earth with his companion Liz Shaw to oversee the project, he soon develops grave misgivings. Things begin to go very wrong when a mysterious green substance leaks from the drillhead. A substance which turns all who come into contact with it into alien primeval creatures called Primords. Meanwhile, the Doctor finds himself transported into a parallel universe identical to 20th Century Earth. The mystery deepens as he finds that although the place, time and people are all the same, no-one seems to know who he is. 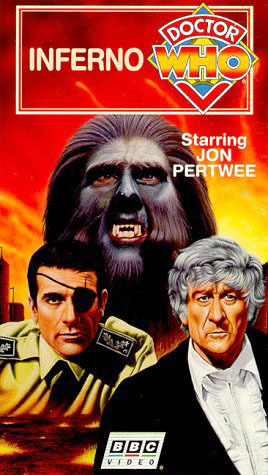 Originally transmitted 9 May - 20 June 1970, this seven part adventure starring Jon Pertwee was the last to feature the original TARDIS console which dated back to 1963.